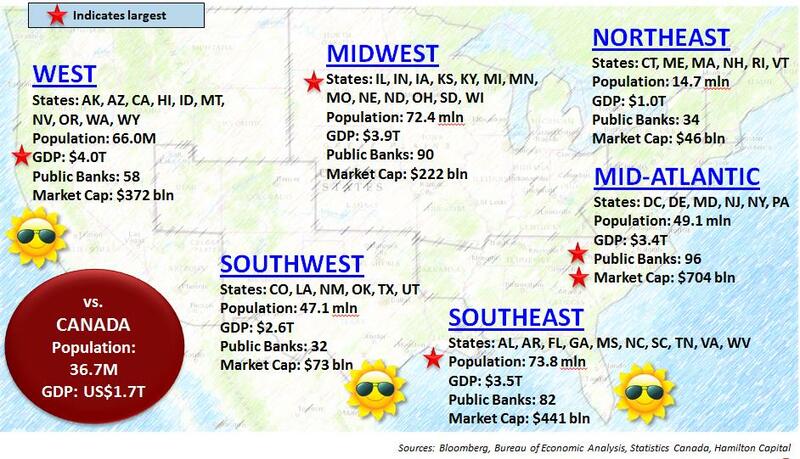 In banking, as in most businesses, geography matters. Population growth supports GDP growth, which in turn drives revenue growth. 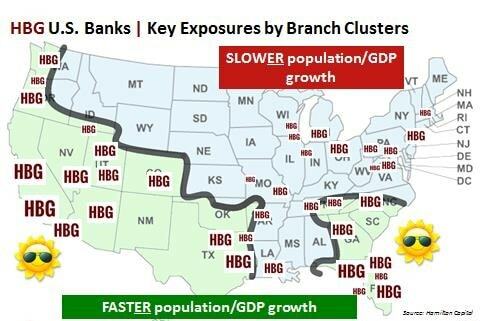 In general, U.S. bank investors divide the U.S. into six distinct regions: the Northeast, Mid-Atlantic, Midwest, Southeast, Southwest, and West (see chart at the end of this comment). Within these regions, there are 53 metropolitan statistical areas (MSAs1An MSA is typically a large city and outlying suburbs, analogous to the Greater Toronto Area (“GTA”). MSAs are defined by the U.S. Office of Management and Budget.) with a population greater than 1 million and nearly 40 with a population greater than 1.5 million (hereafter referred to as “large MSAs”). And there are huge differences in population growth and GDP growth between these different regions/markets. For example, the 15 fastest-growing large MSAs by population growth are growing four times (!) faster than the 15 slowest-growing large MSAs. The 15 fastest-growing large MSAs by GDP growth are growing GDP three times (!) faster. These are highly material differences. So, where are these fast growing MSAs? Every single fast growing large MSA in the U.S. is located is in the Southeast, Southwest, and the West, i.e., those areas with warmest climates. 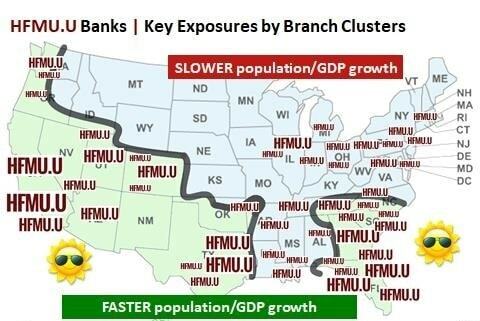 The map(s) below carves out two large areas that are dominated by the fastest growing MSAs and shows where the banks in Hamilton Capital U.S. Mid-Cap Financials ETF (USD) (HFMU.U) and Hamilton Capital Global Bank ETF (HBG) are located by branch cluster. The ability to generate EPS growth outperformance is a very important variable for HBG and HFMU.U’s stock selection, since it is the most important driver of longer-term performance. It is worth noting that, as the year began, consensus estimated portfolio–weighted EPS growth for HBG and HFMU.U in 2018 is 21% and 24%, respectively. 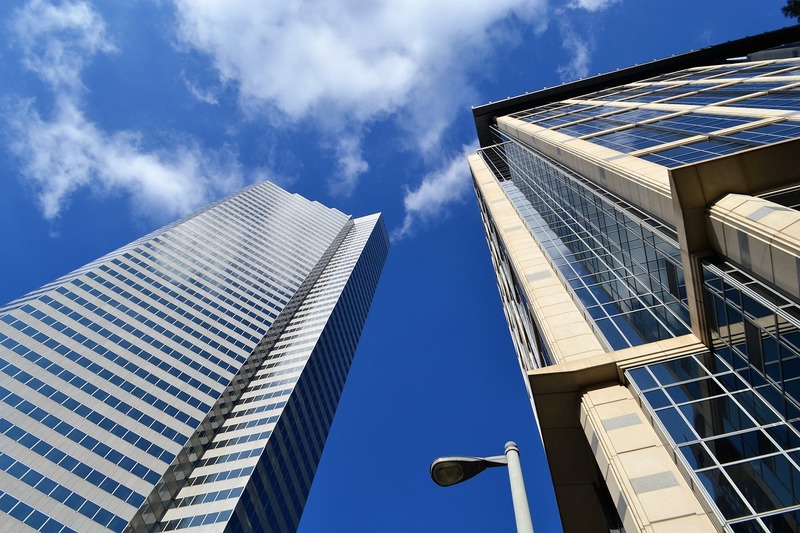 Banks domiciled in these higher growth areas also tend to be more attractive takeover candidates, especially for larger banks located predominantly in slower-growth areas. Note, in prior quarters, we have posted HBG and HFMU.U Manager Commentary with the EPS growth profile of our U.S. holdings. So far, the portfolios have experienced materially higher EPS growth than the sector averages. This, in part, helps explain why the Hamilton Capital Global Bank ETF (HBG) has outperformed the KBW Global Bank Index by 12% (since inception) as of December 31, 2017. 1 An MSA is typically a large city and outlying suburbs, analogous to the Greater Toronto Area (“GTA”). MSAs are defined by the U.S. Office of Management and Budget.